Dubuque City Hall is located at 40 West 13th Street, Dubuque, IA 52001; phone: 563-589-4100. Photo: Edward Langworthy House, ca. 1856, 1095 West Third Street, Dubuque, IA. Listed on the National Register of Historic Places in 1972. Photographed by Jack E. Boucher, 1977, Historic American Buildings Survey [HABS IA-30-14], memory.loc.gov, accessed January, 2014. Dubuque, on the Mississippi River opposite the junction of the Wisconsin and Illinois State boundary lines, is one of the State's oldest cities. The business and industrial centers are crowded into a narrow strip of land close to the river's edge. Wide bottomlands, often flooded over, spread out to the north and south of this circumscribed area. High bluffs, some of the rock precipices, all but jut out over the business center where tall buildings reach to their height. Main Street, on the first natural rise above the river, forms the principal artery of business. Side streets reveal long rows of houses against the stone bluffs where streets come to a sudden stop. Back on the hilly plateau is a residence section, extending from Mount Carmel Road on the south to Eagle Point Park on the north. Some homes stand at the cliff's edge overlooking the city like ancient citadels. Streets here wind around hills and up steep slopes where tall trees help to emphasize the isolation of the section which is never seen from the highways leading in and out of the city. Relative to other cities of the prairies, century-old Dubuque gives an impression of settled age and established tradition, to which the German and Irish have contributed in their own way. The city, which adopted the city-manager form of government in 1920, draws much of its trade from the farmers of the rich agricultural region nearby, many of whom sell their products at the municipal market. Foremost among the city's varied industries are the sash and door mills. Metal working and plumbing plants are also important, as is the ship-building yard. Julien Dubuque, a French Canadian, for whom the city is named, arrived in (Prairie du Chien (Wisconsin) about 1785; three years later, he obtained permission to mine the lead ore in the river bluffs at Catfish Creek, near Kettle Chief's Indian village. The first white man to settle permanently in the Iowa region, Dubuque made his home just south of the present city. Later he certified his claim to the land doubly by naming it, "The Mines of Spain," and obtaining formal recognition from Baron de Carondelet, then Governor of Louisiana under the Spanish government. "Little Night," as Dubuque was known to the Fox Indians, seemed to possess great power over them. There are several legends regarding this power, the most popular being associated with the refusal of the Fox to grant one of Dubuque's requests. Even Dubuque's threat to burn the entire Mississippi did not move the stubborn Indians. So, while one of his associates emptied a barrel of oil into the water above the bend of Catfish Creek, Dubuque called the Indians from their lodges for consultation around the big bonfire he had built on the bank. Seizing a firebrand, he threw it on the water, smooth with oil. The sheet of flame rising instantly so terrified the Indians that they conceded all Dubuque asked. Then, supposedly at the exercise of his will, the fire went out. When Dubuque died the Indians buried him with honors befitting a chief, competing with one another for the privilege of carrying his body to the grave. A tomb of wood and stone was erected and upon a cross was inscribed: "Julien Dubuque, Miner of the Mines of Spain; died March 24, 1810, age 45 years, six months." For years after his death the Fox did not allow others to mine the lead. White men tried to take possession of the district in June 1830, but since they had violated agreements with the Indians, the United States Government forced them to return to the east side of the river. On June 1, 1833, under terms of the treaty with Chief Black Hawk, the territory was thrown open to white settlers. Before Dubuque was a year old, stores, saloons and cabins bordered both sides of the muddy main street. The first school, started in 1833, was taught by George Cubbage who, it is said, was captured by the Indians during the Black Hawk War. Later he was sold to a trader for a plug of tobacco because he was baldheaded and could not be scalped. At this time there was no government in the Territory. Lawlessness prevailed. Patrick O'Conner, a miner, killed his partner, George O'Keaf, and readily admitted to his crime, assuming he could not be prosecuted since there were no laws. The settlers, however, took matters into their own hands, established a court, tried and sentenced, and hanged O'Conner in June 1834. Shortly after this, the Methodists erected a log church, the first church building in Iowa. In September 1834 when the Territory of Wisconsin created the two original counties of Iowa, Dubuque was made the seat of government of Dubuque County, which included all of the Black Hawk treaty land north of Rock Island. Dubuque, lusty and ambitious, felt superior to other cities on the river. A boisterous mining town, it sheltered intellectuals side by side with illiterates. So great was the income from lead mining here that the Territorial Legislative Assembly of Wisconsin chartered the Miners' Bank of Dubuque, the first bank in Iowa, in 1836. In this year, too, the town boasted the first newspaper in what is now Iowa, the Du Buque Visitor, printed on the first press in the territory north of Missouri and west of the Mississippi. The people of Dubuque expected their city to be made the capital of the Territory of Wisconsin. As one of its newspapers predicted: "A proud city shall be reared where at present stands our flourishing village ... when the lofty spires of the State house and churches glitter in the rays of the sun and the glossy bosom of the fair Mississippi shall swell beneath the weight of commerce." However, when another city was chosen, Du buque did not lose its belief in its importance as the Queen City of the Northwest. The settlers in Dubuque voted for their first representatives to the Legislative Assembly of the Territory of Wisconsin in the fall of 1836, almost a year before a local government was established. The city was not formally organized until the next spring when the citizens met in the Methodist church building to elect a board of five trustees. In 1841 the town adopted the charter granted it by the Territory of Iowa. During the 1840s and the 1850s Dubuque lost its place as the largest city in Iowa to Burlington. 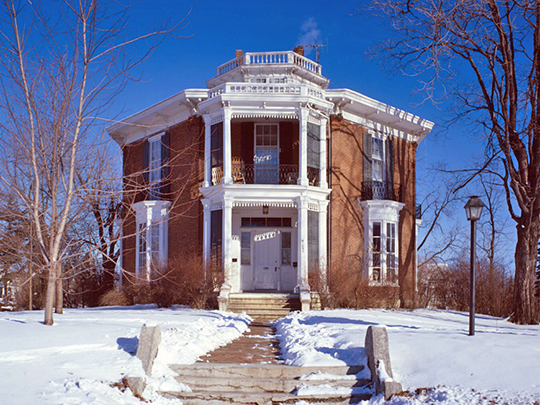 Three colleges were opened during this period; the University of Dubuque, 1852; Wartburg Seminary, 1854; and Clarke College, 1859. In l855 the Illinois Central Railroad reached the shore opposite Dubuque. Cannons roared and bands blared as Dubuque people turned out in the sweltering heat to celebrate the event and to hear Senator Stephen A. Douglas toast the railroad as "the great work of the age." The Dubuque & Pacific Railroad Company, which built the fourth railroad to cross Iowa, was formed April 22, 1857. The people of the city and the county voted bonds worth $600,000 for its construction. Eleven years passed before the Mississippi was bridged at this point. In 1867 the two railroads were consolidated. With the influx of many immigrants to the fertile prairies of northeastern Iowa, by 1860 Dubuque had again become Iowa's largest city. Lumbering had replaced mining as the important industry, and the mills were increasing their production daily. Huge log rafts were floated down from the north and converted into lumber and ties for the railroads that were opening new paths into Iowa. Another asset was the Dubuque-East Dubuque wagon bridge across the Mississippi, which opened in 1887, and brought in an external trade territory to the east. Dubuque suffered four disasters from 1876 to 1919. Thirty lives were lost in the Catfish Creek flood of 1876; in 1894 almost the entire lumbering district was wiped out by fire, and in 1911 a second conflagration destroyed practically the entire industry. The last disaster was the 1919 flood, which took seven lives and caused property damage in excess of $100,000. The lumber industry came to a close in 1915, but out of it grew the large wood working factories that today constitute the city's leading industry. The daily newspaper, the Telegraph Herald and Times Journal, traces its descent from the first paper in Iowa, the Du Buque Visitor. The Catholic Daily Tribune, printed here, is the only daily Catholic newspaper in the English language printed in the United States. George Wallace Jones (1804-1894), one of Iowa's first two United States Senators; William B. Allison (1829-1908), who was United States Senator from 1873 to the time of his death; and David B. Henderson (18401906), Speaker of the House of Representatives and outstanding legislator, made their home in the city. Among the city's authors are Marion Hurd McNeely, novelist and poet, accidentally killed in 1930. She is remembered for her children's stories and novels which include Rusty Ruston, The Jumping Off Place, and The Way To Glory. The Reverend M. M. Hoffmann of Columbia College has written Antique Dubuque, a history of the Dubuque territory before 1833.